Like a newly sprouting garden, Tosh’s Ramen isn’t much to look at. It sits in the same sad space as a Korean restaurant did last year, in a sad strip mall, on a sad block of title-loan sharks and payday-lending piranhas. Its chairs are a flimsy variety of the ubiquitous plastic lawn chair, and its tables are small. Yet, people know about it, and many love it. Tosh’s Ramen is a church to worshippers of a passing time, where secrets are revealed in bowl after steaming bowl of flesh, water and wheat. The keeper of the flavor’s secret, Toshio Sekikawa, holds his congregation in thrall. Sitting at his tables, they connect with a cosmic circle of Japanese culinary knowledge and a tradition of perfect yet changing flavors. I see them here in numbers, some many days a week, pretty much from the time he opens his humble doors until he thanks them on the way out at 3 p.m. and again at 8 p.m. They are here to live, for a few minutes, in the comfort of soup and to note, quietly to themselves, the differences from the time before, and the time before that—and I have to admit that it makes me envious. I don’t really have a feel for ramen, but I hope to, with some work. As my friend, sushi chef Tony Rivera at Takashi, said, “In the West, we taste oils for flavor, and cooking is designed around oils. In Japan, flavors are set around the things in water, like salt and seaweeds and the umami taste of fish, mushroom and ferment. It’s much more subtle.” The soul of the soup is in the broth, but the body is in the noodle. The word “ramen” is a Japanese word that derives from the Chinese word “lamian.” Unlike the instant, prefried kind you settle for at mere quarters a package, this noodle is yellow, coarse and muscular. It burrs my lip a little when I slurp it, and it bites and chews in a satisfying way. It is the constant horizon to the broth’s changing sky. Sekikawa’s broths differ subtly, style to style and day to day. 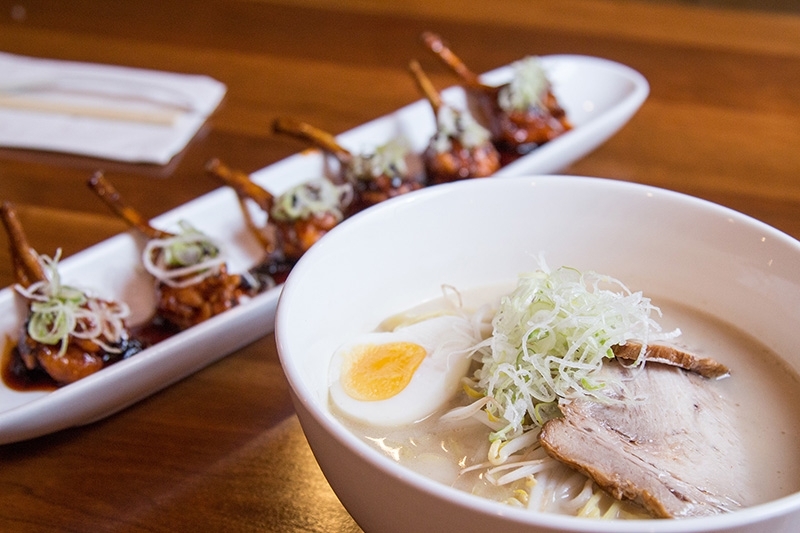 Ramen houses take pride in their broth’s particulars, and each is a secret, a labor of love. Innovations to the broth and the noodle are, like fashion, quickly adopted. However, ramen evolution from outside Japan is scorned. 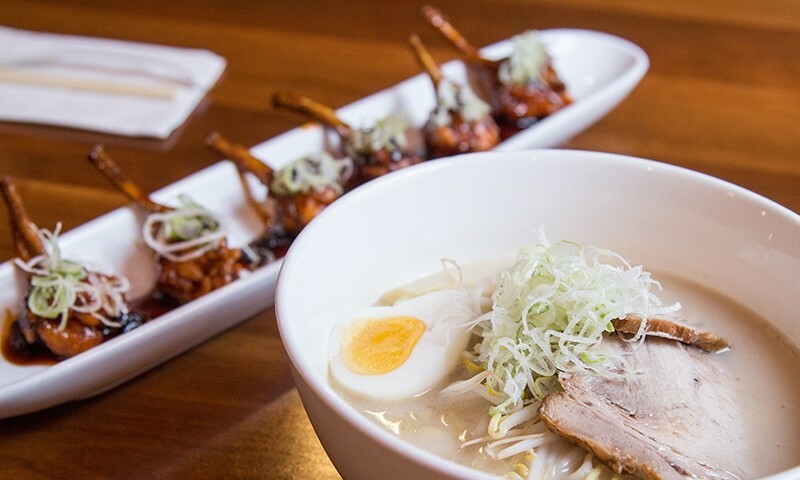 Tosh’s are traditional kinds of broth, and his ramen service is old-school. He and his soup are placeholders of a history for which young Japanese yearn, and which the older ones remember and esteem. The menu at Tosh’s is appropriately small: six Ramens, a few appetizers and one dessert. The service is provided by hip kids who obviously like the job and do it well. There in the back is Sekikawa. He will probably greet you as you come or go. Mostly, he is at the bowls and hovering near steaming cauldrons. Your food is his by design and often by his hand. The Tonkotsu Ramen ($8.95) has a hemisphere of boiled egg bobbing by spring onions and three wide slices of fatty, striped pork belly. The broth is butter-colored with rendered fat. Its taste is subtle in distinction but big in character. It’s a rich mouthful. The noodles eat al dente and slightly grainy. The Shoyu Ramen ($8.95) is lighter in the broth—in color and in mouth feel—but otherwise quite similar in dress and pleasure to the Tonkotsu. The Karai Ramen ($9.95) is a bigger soup with a spicy miso base added to the broth. It comes with a mirin-infused mushroom, roughly minced pork and bean sprouts, and bigger body is a little more “fall” in color and warmth. The heavy and more expensive Curry Ramen ($10.50) has a gravy-minded body, brown with curry and sporting breaded pork cutlets and fat-crunch leafy greens. There is a Vegetarian Ramen ($8.95) as well, and yam noodles can be had for a vegan diet. The appetizers are popular—most tables seem to share a few. The Tokyo Wings ($7.50) are sweet and tender. They come six on an albatross-bill-shaped bowl. The Kushikatsu ($6.95), skewered medallions of pork fried in panko, are served with a hoisin-based dip, and the Gyoza ($6.95), are small fists of minced pork and greens in hand-pinched dough. With an acidly bright dip, they are very particular—not your mama’s pot stickers. For drinks, they offer green tea ($2.50), hot or cold, iced tea ($1.50), Perrier ($1.50) and American canned sodas ($1). For dessert, there is Annin Tofu ($2.50), which is a fresh apricot cream sweet. Juzo Itami’s very funny foodie movie, Tampopo is a good place to look if you want to witness the church of ramen in its original glory. Tosh’s Ramen is the oldtimey church of ramen that moved in just down the street. I think you should go there and get a bowl full of the good news.